On December 12th a number of us had attended Christmas in the Abbey with the Federation at Hexham and had been amazed at the skill shown by the young solo violinist Leia. We had enjoyed some shopping and lunch before the service. On a miserable December night we held our Soup and Sweet Christmas Party hosted by the committee. However the mood in the hall was festive with decorated tables, seasonal music from Fliss Edmunds and the traditional Secret Santa. We also had a fun domino drive with a prize for the winner and the looser. We unveiled the keyboard, which we have purchased to celebrate last month’s 85th Anniversary. We are also looking forward to next month’s meeting when S. Wylie will be explaining about SHAK dog rescue service. November 1928 saw the formation of Shilbottle W.I. in the Council School Hall under the Presidency of Mrs McLain. We do not know haw many members there were but there was a committee of 19 which suggests a large attendance. 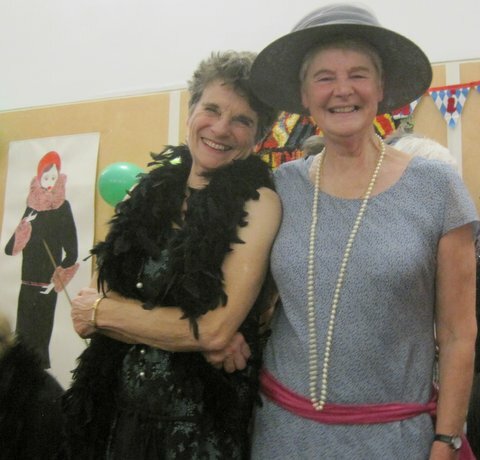 So on 21st November we celebrated the 85th anniversary with a gathering in Shilbottle Community Hall. Visitors and guest had been invited to come in the fashion of the 20’s and the number of flapper girls in all their finery certainly brightened the room as did the excellent pictures of stylish women of the 1920’s that decorated the walls. These were expertly painted by Fliss Edmunds our President who also beautifully decorated the Birthday cake, baked by Linda Shaw. Lillian Hume turned 85 this month and had the privilege of cutting the cake after the toasts. We had enjoyed the meal severed by Lynemouth Centre Caters as we listened to appropriate background music. Soon it was time for the lively entertainment provided by Andrew and Margaret Watchorn which had feet tapping, hands clapping and voices joining in to popular Northumbrian tunes. There was an interesting display of W.I. photos and artefacts put together by Linda Law, Secretary, which had bought many happy memories of shared past events and demonstrated what a vibrant and active organisation we are today. Those members that had attended the Hotspur Group meeting at the Costello Centre had been right royally entertained by Renaissance Costumes with their collection of Tudor and Elizabethan hand -made gowns, followed by a supper, provided by Alnwick W.I.. Shilbottle were fortunate to win the Competition cup with their Pomander. We also came away with awards at the recent “Anything in a jar or Bottle” event at Cresswell House. The two darts teams met each other on the next round and the domino A team continues to make progress. We had a good take up for the Christmas Concert at Hexham Abbey and a few members have taken up the invitation from Warkworth W.I. to play at their bowls practice in the Memorial Hall. The walking group and book club continue their monthly activities. We had also enjoyed the lunch at the Cook and Barker a few weeks earlier. Tracy Nicholson from Greggs the bakers was waiting patiently to start her presentation for the October meeting. She gave a short history of the company, which started from humble beginnings with John Gregg selling yeast and eggs from his bicycle in Newcastle in the 1920’s . Now it is a nationwide brand selling a wide variety of food from 1,600 shops. The Gregg Foundation supports the N.E. Children’s Cancer Run, Children in Need and School Breakfast clubs amongst its valuable charity work. The generous sample cup cakes were a welcome addition to the supper table. We are anticipating our next meeting on Thursday November 21st as we will be celebrating our 85th anniversary with a party. Names were taken for The Hotspur Group meeting, which will take place at the Costello Centre in October, and we answered the invitations from various local W.I.s. Our darts and domino teams continue to make progress in the County Competition and Linda Law Has won the Judges’ Cup for her photo that was chosen for next year’s calendar. The Speaker, Brian Burnie, had set up a colourful stall and was all set to tell us the fascinating background to his Charity “Daft as a Brush” which provides Cancer patient transport through out the region. He talked about the people that had influenced him in his life and how his fleet of vehicles and the band of volunteers assist patients at a very difficult period. We all felt this was an extremely worthwhile project. On a beautiful July evening Fliss Edmunds welcomed members and visitors from Felton and Thirston, Craster, Warkworth,Longhoughton and Boulmer to our Musical Event. 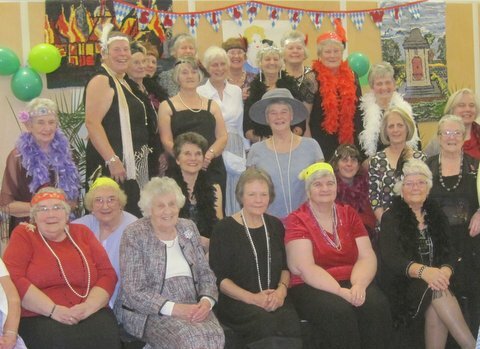 There had been a successful garden party earlier in the month and a team represented the W.I. in the village quiz. Maintenance of the small garden at the Community hall was continued with the addition of a gravel mulch spread by a few energetic members. The Darts and dominoes team have started the season with successes and those that have attended courses at Cresswell House have been impressed by the building improvements. The weather was just perfect for the coastal walk held a Druridge bay. Malcolm Bennett and Jimmy Little entertained us with a selection of songs old and new. Their varied programme, on guitar and harmonica, soon had feet tapping and women singing along with them. After the music we were all anticipating the pooled supper and as usual the women of Shilbottle had produce a fantastic spread which was appreciated by all. Sheila Graham from Longhoughton and Boulmer gave a vote of thanks on behalf of the visitors. On Wednesday 12th June some members of Shilbottle W.I. travelled to Skipton where after a look around the town we went on a Narrow Boat Cruise on the Leeds to Liverpool Canal. We enjoyed the wildlife at close quarters and were treated to a cream tea. This was the first meeting that Felicity Edmunds, the incoming president, had chaired and it was at Spurelli’s Ice Cream Parlour in Amble. We heard the history of this artisan ice cream establishment and after seeing the interesting manufacture of two varieties we tasted many other flavours of their delicious wares. Earlier this month our team had enjoyed the Car Treasure hunt at Hepple also a number of members travelled to Skipton where we experienced peaceful canal cruise complete with cream tea in glorious sunshine. The weather was kind for the sand sculpture competition at Bamburgh where 7 Shilbottle women built a sand bus for the transport theme. Fliss Edmunds, the vice President, welcomed members and one visitor to our April meeting. The Quiz team were very narrowly beaten into second place at the County Final at Stannington by just one point. The delegate’s report of the Council Meeting at Alnwick Playhouse informed us of events and occasions concerning Northumberland Federation, especially the refurbishment the headquarters at Cresswell House and the courses taking place there. We are looking forward to Shilbottle’s Annual Lunch, which this year is at the “Running Fox” Felton on 23rd April. As usual various dates for the diaries were announced including an invite to Howick W.I., a return of the sandcastle Competition at Bamburgh and a Car Treasure hunt at Hepple plus the usual Book club and walking group. The demonstration saw the welcome return of Elizabeth and Mary Davidson with some tasty recipes and beautiful flower arrangements. They were fresh from their successes at the Alnwick Spring Show. After Mandy Johnson had welcomed members to the March meeting congratulations seemed to be the order of the evening. 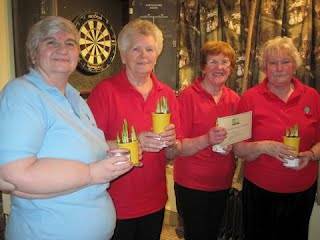 Sheila Robertson had won the Federation Beetle Drive held at the Community Hall, the darts A team were worthy runners up in the final at Stannington and the bowls A team progressed to the semi-final in the Carpet Bowls Competition. We hope that the Quiz team have similar good fortune in the County Final. Regular events will continue this month with meetings of the Book club and Walking group. We will be sending members to the Council Meeting at Alnwick Playhouse and were pleased to hear the building work is complete at Cresswell House, the Federation Headquarters. Jon Monks was our speaker and he inspired us with his enthusiasm and business skills employed while building up a thriving enterprise with Shepherd Walks and Capricorn Socks. We also appreciated the inside information he had on some T.V. personalities that he has worked with, on for example, Countryfile. The meeting opened with a short business meeting and details of the many activities were discussed, e.g., the walking and reading groups, arrangements for the annual lunch and an outing to Skipton later on in the year. Also, our two darts teams have again been very successful this year and had to play each other in the Regional semi finals. So well done for the A team going through the final. Our speaker this evening was Debbie Nicholas who gave a practical demonstration on the art of box making. She provided all the members with materials to make two boxes and after a few false starts from some of us, we all produced two pretty boxes. It was a very enjoyable session. The winter snow and frost had arrived so we were glad to see such a good turnout for the first meeting of 2013. Mandy Johnson wished everyone a happy New Year and said how much we had enjoyed at the New Year Party held on 12th January with excellent food and lively entertainment. We are also looking forward to the Indian meal at Bengal Cottage at the end of the January. Once again the 2 darts teams have been successful and play each other in the area finals. We are sending teams to the Federation quiz, Carpet Bowls completion and beetle drive in the coming months. Various knitters took away the simple pattern for a jumper which when the garments are finished will be sent for premature babies in Africa. The January speaker was Sue Nutall representing the Charity Water Aid which does valuable work providing clean water, sanitation and hygiene training in third World countries by empowering the local people to contribute to these schemes. This is especially life changing for women. Sue also told us about the intrepid trip she had undertaken last year climbing Kilimanjaro also fund raising for Water Aid. The hall and the tables looked suitably festive for our Soup and Sweet Christmas meeting on 20th December. Despite the wind and rain outside we were soon in party mood as the committee served up a wide variety of delicious food and wine. We then exchanged gifts as part of Secret Santa before Fliss Edmunds expertly accompanied us on the keyboard to a selection of seasonal songs. Those who had attended the Federation Panto, Carol service and Christmas event at Heighley Gate had enjoyed themselves. The birthday flowers were given to Cynthia Stalker and Linda Shaw won the raffle. We voted on the 2 resolutions that will be put forward at the A.G.M. in Cardiff. Our November meeting was held in the Haven Common Room because the Community Hall was being used for the Police and Crime Commissioners Election. Various arrangements were made for the coming season. We are having lunch at the Cook and Barker and entries were submitted for the Christmas event at Heighley Gate, which we will be also visiting. A party are looking forward to “Strictly Panto” on 22nd November. Some members are attending the federation Carol service at Hexham Abbey and the walking group and book club continue with their activities. We were then treated to a slide show of the many events and activities the Shilbottle W.I. have participated in during the last few years. We were amazed to see the wide range depicted from Orienteering to Circle Dancing. The majority however seem to be of special meals or parties as we are always up for a good night out. Felicity Edmunds, our Vice President, welcomed members to a well-attended meeting on 18th October. This may have been something to do with the excellent chocolate making demonstration given by Lynn Oxley. There were many sorts of delicious chocolate to sample. At the Hotspur Group meeting at Alnmouth we were awarded the Challenge cup mainly for our good performance in their Quiz. The Darts A team had their first win of the season against Cambo but the Domino B team were narrowly defeated by Hepple. We hope to have a successful Coffee morning on 20th Oct. at the Community Hall and will be helping out at the Village Litter Pick on 27th Oct. The regular book, lunch and walking groups continue with their meetings. Mandy Johnson, our recently appointed president, welcomed members and 2 visitors to our September meeting after the summer break. There was a lot of business to get through and dates to give out including the Autumn Federation event at Heighley Gate on 29th September and the Hotspur Group Meeting at Alnmouth on 17th October. At the village Autumn Fair we manned the refreshments and ran the cake stall. We shared the profits of our stall with the Hall and the Church. Thanks to all who helped. We are also running a Coffee Morning on 20th October 10-12 at the Community Hall. We were intrigued by the title of the evening’s speaker – “ A Year behind the Veil”. Mrs Kilner soon had us enthralled in her sometimes horrific experiences as a young bride and mother in 1960’s Iraq. She somehow made us laugh at the extreme culture shock that endured. Ingrid Wagner with her Giant knitting could not attend. This was a disappointment but in true W.I. spirit one of our own members Barbara Thompson stepped into the breach. She dashed home to fetch materials and equipment to demonstrate making a paper quilling gift tag. We were soon all engrossed in this craft and were proud of our efforts and especially grateful to Barbara. We had enjoyed the trip to see Starlight Express in Edinburgh but the wet weather meant we had to have the annual garden party indoors for the first time in 4 years. Nevertheless we had an excellent pooled lunch. We had sent 2 teams to the Hotspur Quiz at Longhoughton and they had a good night with one team gaining first place. We have a break in August but the Lunch group ,book club, darts players and walkers will be continuing their activities throughout the summer.